There are vacations and then there are trips. To me, the former conjures up images of lounging, reading, and drinking cocktails with umbrellas in them. The latter usually involves sight-seeing, activities, and being constantly on the go. I've done plenty of both and have grown to love each. I’m quickly learning that traveling with kids is all about finding the perfect balance between “vacation” and “trip” - keeping them entertained and happy and sneaking those brief moments of relaxation whenever possible. Paradisus - La Esmeralda grasps this concept fully. They know just how to cater to families trying to strike a balance. The mini bars are stocked with both liquor and chocolate milk. The turndown service at the end of the day includes champagne for the adults and cookies for the kids. 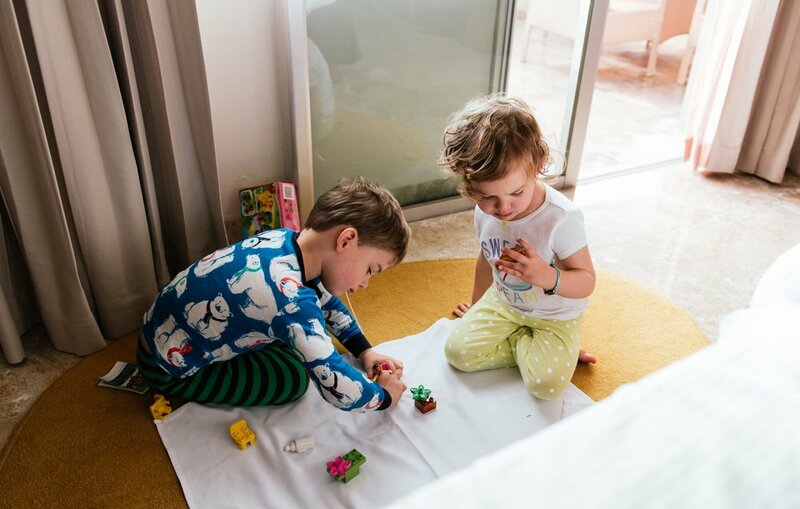 And while Andrew and I didn’t go so far as to drop our kids off at the in-house day care and peace-out to the spa, we did decide - after our action-packed second day - to spend our third day hanging around Paradisus and taking advantage of its many amenities. We slept in, watched the sunrise from our balcony, and ordered room service for breakfast. The kids played with Lego sets my mom had sneaked into their luggage and Andrew and I actually got to savor our morning coffee. One of my favorite moments from the trip came that day when Nora discovered there were kid-sized slippers and a bathrobe in the closet to match the ones I’d been wearing. She donned them and we were “twinsies” most of the morning. It was such a sweet moment and a beautiful reminder that the most meaningful memories can be created even when you’re not actively seeking them out. When we decided we were ready for an excursion, we didn't need to venture far; the pool and the beach at the resort were all the entertainment we needed. My little water babies loved swimming the ocean - meaning they clung to us for dear life as Andrew and I jumped up to ride each cresting wave. We built castles on the beach and let the waves wash up on our feet and cover our toes with sand. When we needed a break, we headed for the pool where we lounged in cabanas, ordered food and drinks, and relaxed while the kids splashed in the water. Upon the recommendation from our fabulous butler (did I mention there was a butler?! ), Paulina, we dined that night at the resort’s teppanyaki restaurant. Not exactly authentic Mexico, but delicious and highly entertaining for the kids. When we returned to our room at the end of the day, Paulina had a surprise waiting for the kids: a bubble bath in the huge tub with balloon swords and animals in it. (This was on the heels of a treasure hunt she had staged for them in the room the night before.) They were delighted and it was the perfect ending to the perfect day - one where we had just the right amount of activity and relaxation, the perfect mix of vacation and trip.